It's been a full weekend for the first batch of Apple Watch pre-order customers to experience Apple's wrist-worn device for themselves. While some issues like the impact of the Watch on an iPhone's battery life remain in contention, many early adopters agree the wearable's ten available watch faces offer a deep amount of customization for Apple's most personal device yet. All of the different watch face options can be a bit confusing, so we've put together a video showcasing not only the detailed differences between each face but the complications most of the faces include to allow users to display various bits of information. Apple Watch faces range from heavily customizable (chronograph) to essentially no customization whatsoever (astronomy and solar), and over the weekend many new Apple Watch owners took to the MacRumors forums to share photos of their watches, including everything from the initial packaging to pictures of the wearable on their wrists with their preferred watch faces and home screen layouts. While the initial set of watch faces and the various options allow for significant amounts of customizability, Apple hints in its Apple Watch User Guide that it may add more options in the future. Apple Watch includes a variety of watch faces, any of which you can customize to suit you. Check frequently for software updates; the set of watch faces that follows might differ from what you see on your Apple Watch. 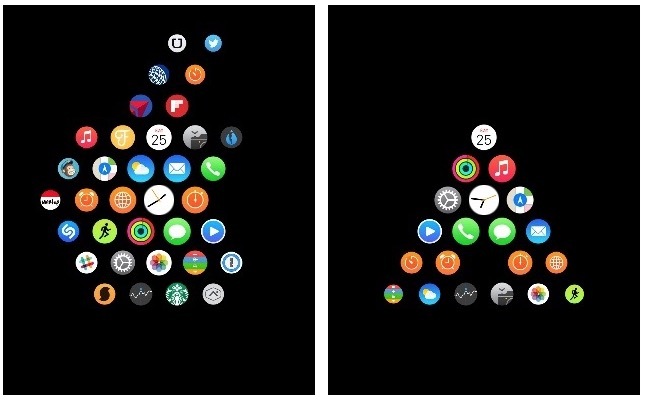 Beyond watch faces, the home screen is another area where users can show some creativity with manipulation of the constellation of apps from within the Apple Watch iPhone companion app. Some users have created completely new shapes of their own design, while others have recreated famous logos, from Apple's to what appears to be The Legend of Zelda triforce. It's seems like Apple has kept a lot of the Watch's features close to its vest. Maybe that's part of wanting to under-promise and over-deliver. Considering the amount of customization (given a relatively limited set of parameters), better than anticipated battery life and perks like being to use many aspects of the Watch without an iPhone nearby, it looks like Apple has another hit product. Why is there no way to display seconds on any of the digital watch faces? Every one of the analogue watch faces has a seconds hand. Why no seconds for the digital faces? This is my favorite one I found by a forum user. 3rd party apps on the left and Apple apps on the right! Apple I need a ninja turtle face please!!!!! !